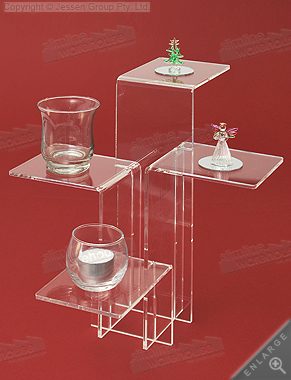 Clear Acrylic Risers are a Tiered Stand for Placing Different Items on Display! 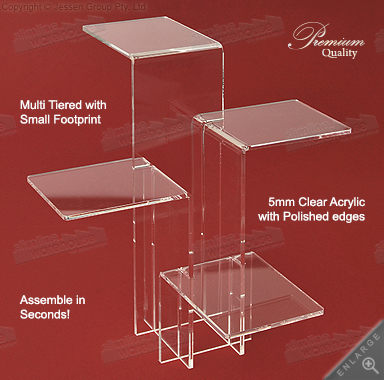 Clear acrylic risers are multi-tiered, making it easy to place multiple items in one small area of your counter! Assembles in under one minute for placement onto counters, desks, or tables with ease! 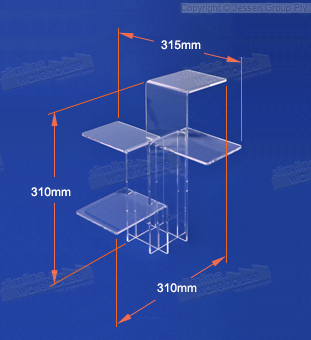 These clear acrylic risers feature an easy to assemble design that requires no tools and takes less that (1) minute to set-up! This feature makes it perfect for use in retail stores, jewelry shops, make-up counters, and more where store fixtures with fast set-up & knock-down are a convenient way to quickly create a merchandising counter! The store fixtures, clear acrylic risers are made from 5mm thick clear plastic that has the visual appeal of glass but at a lower cost! These displays also feature polished edges, providing a professional look that works well within in any décor to gain the attention of passersby. The plastic stands set is a multi-tiered stand that allows you to place different items at various heights, making it easier for visitors to see items and helping to engage them with employees that are working at the counters, tables, or desks. These versatile displays make it easy to place make-up, perfumes, jewelry, and more on display in a single location with different styles available to view. The small footprint this stand provides takes up little room on the counter but still provides an easy way to view the displayed items, helping to entice customers to make a purchase! 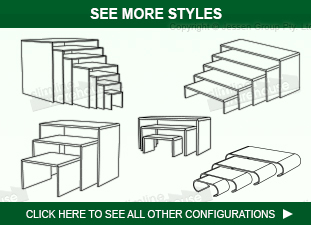 There are store fixtures of many different styles that allow you to find the right fit for your business needs. Our wide selection of plastic displays makes it easy to outfit your business with a stylish design without breaking the bank.